Pork contains lots of vitamin B, which we need for producing energy. We want to eat it especially when we will be exercising a lot or when we tire easily. Through a sort of confusion of the schedule, I had classes today, but didn’t eat school lunch. 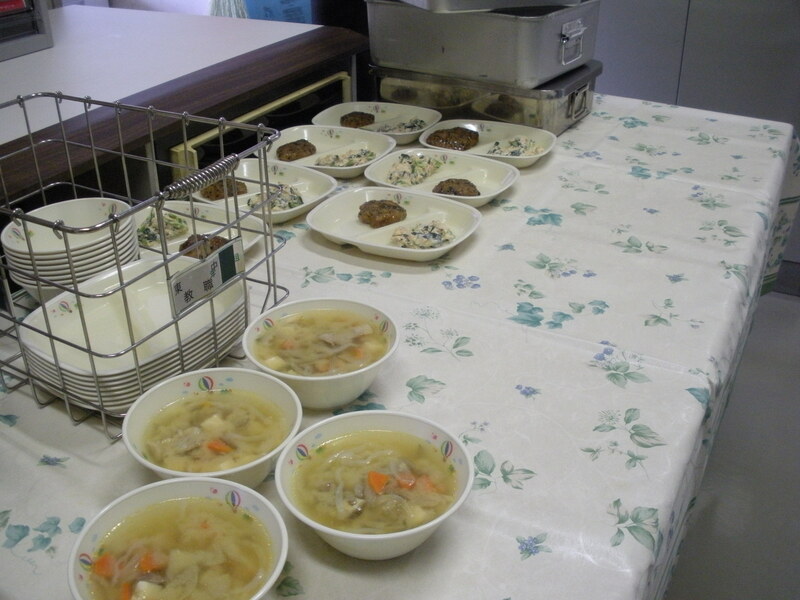 But above is a photo of the school lunches in the teacher’s room, kindly already served into dishes by Higashi’s office lady. Japan is pretty good about labelling where food products come from. For example, at my market, the prefecture where the fresh vegetables and fruits are grown is listed on the same tag as the price. With processed products, many of them are labeled with the prefecture or country their ingredients come from. This is very nice for a variety of reasons. If you are concerned about GMOs, chemical fertilizers, radiation, or food self-sufficiency, this information is useful for making educated decisions. Just knowing the prefecture the food is from is nice, but on some vegetables they actually have a bar code. Going to the bar code’s URL, you can see all sorts of information about the food you are buying. You can see the page for some carrots I bought here. It includes pretty much everything I could want to know about those carrots. 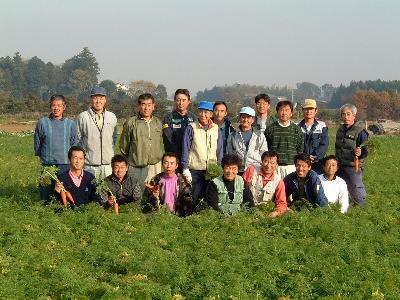 It gives the type of carrot, where they were grown, what fertilizer was used and how often, pesticides used and how much and often, when they were planted and harvested, who packed and transported the carrots, and more. It even includes pictures of the carrot field and the family that grew the carrots. It’s really amazing! These are the people that grew my carrots! Technology is a really wonderful thing. I feel we should always keep working to improve and uncover new technology. The hard part though is having the wisdom to use technology for good things and not bad things. Maybe this is rather insignificant, but I feel my bar coded carrots are an example of the wonderful good things with which technology can help us. The bento I ate today instead of school lunch. 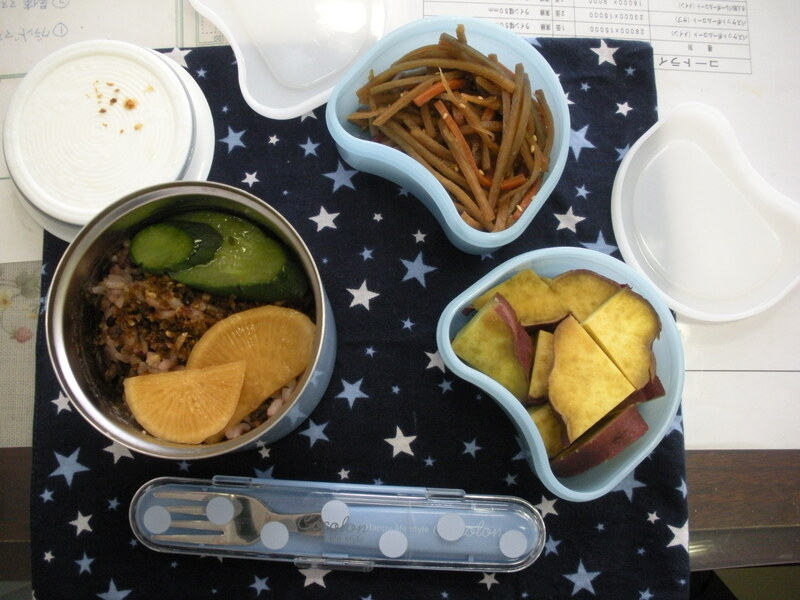 On the left is rice and mixed grains topped in cucumber and daikon pickles. 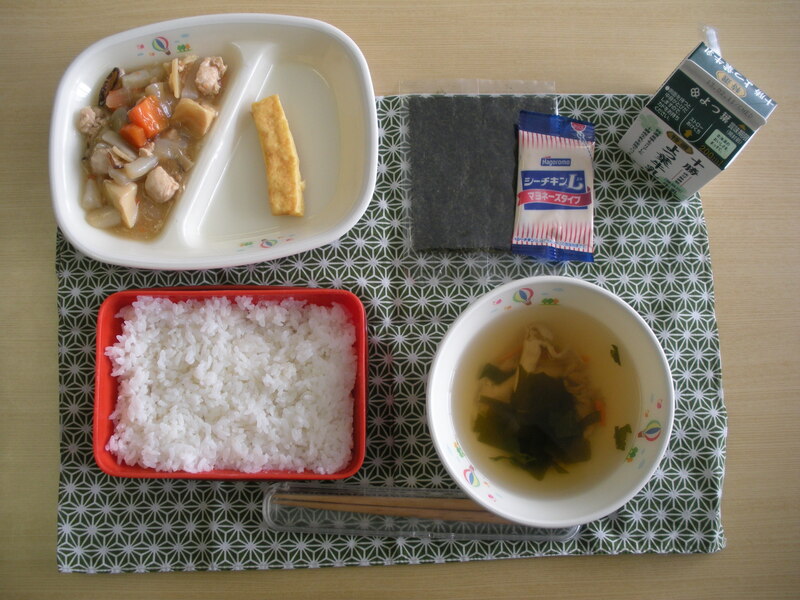 To the right is kinpira burdock and simmered sweet potato. The flavor of daikon depends on the section of it. The upper part nearer to the leaves is sweeter, while the lower part has a more spicy taste. In salad, the thick upper part closer to the leaves is more often used. This Sunday is Setsubun. Traditions that involve food include throwing beans, eating eho maki, and hanging a grilled sardine stuck on a holly branch to ward away bad influences. So as said before, this Sunday is Setsubun or the day before Spring. Mamemaki, or throwing beans is the most common tradition. Where I live, usually whole peanuts are used, but (often candied) soybeans or even small wrapped chocolates are used. “Oni wa soto! Fuku wa uchi!” or “Out the the Demons! In with Fortune!” is shouted. The windows should be opened during this as well, to, you know, let the demons out and fortune in. At the end, most people then eat the same amount of peanuts/beans as their years of age. Eating ehomaki, too, is a now popular setsubun tradition, although if I recall correctly it was invented within the last 100 years following the “let’s commercialize holidays!” style Japan picked up from America. 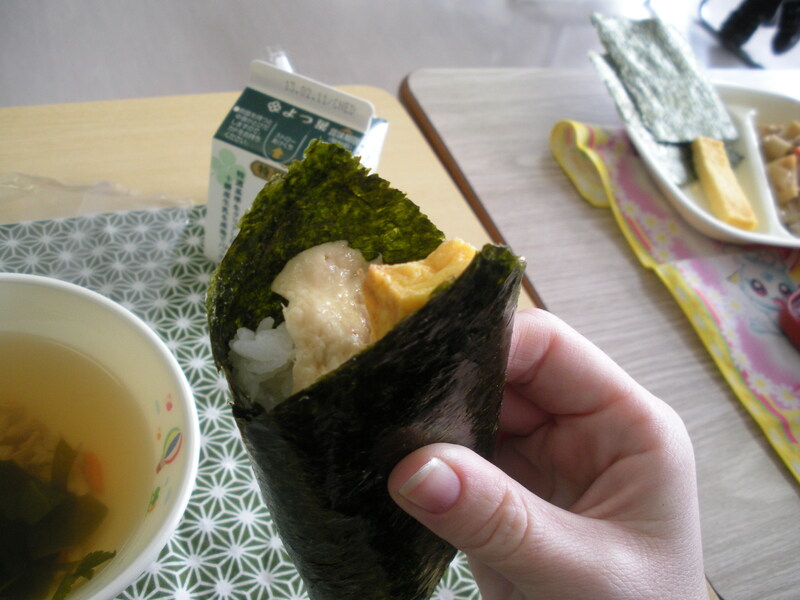 But eating giant makizushi while facing South-Southsoutheast isn’t so bad of a commercialization. As for the sardine head tradition, I don’t know anybody personally who still follows it, but some old traditional families probably do. Onions–with their three flavours of sweetness, spiciness, and savoriness–are a vegetable Western-style cooking cannot do without: to the point they are called the “katsuo-bushi of the West” (西洋のかつお節). They give their deliciousness to many dishes such as curry and beef stew. 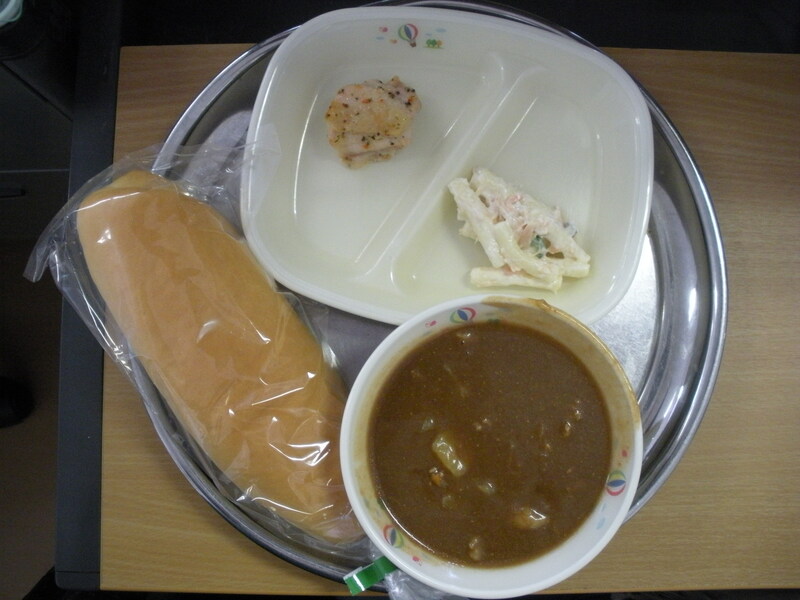 I was in a “Japanese-style Western food” mood today, so I am happy that I could eat gravy stew and coppe pan today. Today I was reflecting that it is good that (in Japan, at least) people eat much more pork than they do beef. Raising pork is better for the environment and less wasteful of resources than beef. It is true that meat is one of our most important sources of iron and a good source of protein, but there is no need to eat as much meat as we do today, from a health perspective. On the contrary, it is beneficial to cut down on meat and meat products because that can reduce the risk of colon and rectal cancer. Broccoli is an unusual vegetable in both the stalk and flower buds are eaten. It is very nutritious and has many vitamins that help prevent colds. Dressed Broccoli is amazingly tasty. I really wonder how they make it. First just try a single mouthful. Try growing your own vegetables and cooking them up. Become hungry [by being active] and then eat. There are many ways to cut vegetables such as “marugiri” and “ichougiri”. Today look closely at the different ways the vegetables are cut in today’s country soup. 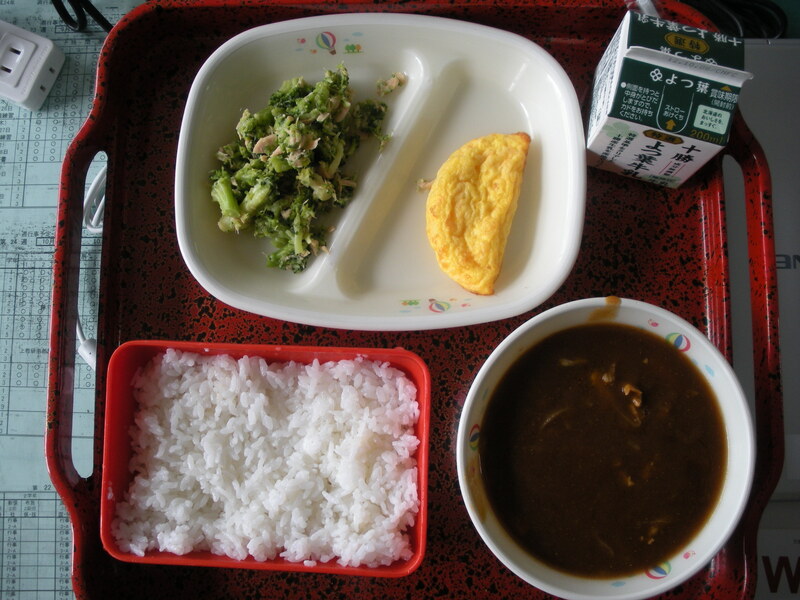 Curry is a very popular school lunch. We make it by using lots of Furano products and slowly cooking it up in a giant kettle. The front of the classroom in Japan is generally arranged in the same way. On the right of the board is written the date and day, along with a place to write who is the 日直 or classroom monitor for the day as well as who is absent or late. To the side of that is written the day’s 目標 or like goal for the day. 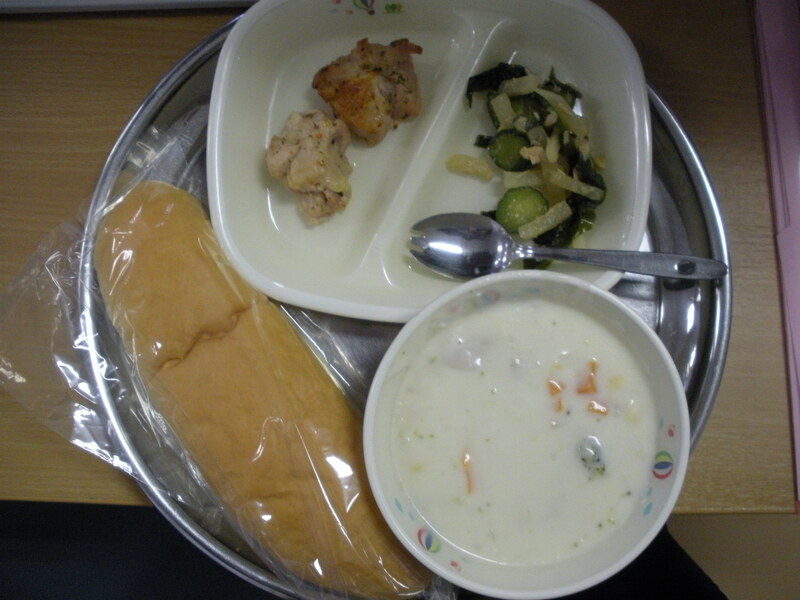 In my morning class today, the goal was 給食をしっかり食べよう or “Let’s eat all of our school lunch today.” But often the goal is something like, “Let’s do our best to get a hundred percent on the English test!” or “Let’s give clear and proper greetings today.” In front of the black board is a long wooden box for the teacher to stand on when writing on the blackboard and in front of the is of course a podium, which the teacher can place documents on and so on. While this classroom setup may not seem significant, it is actually quite interesting as it really hasn’t changed since mandatory schooling was introduce in the Meiji period. As evidence, I present to you below some pictures from some antique textbooks I have. A modern classroom. Not my school, but very similar. Minestrone is an Italian word that means “a hearty jumble”. It is a soup with vegetables like cabbage, carrots, and tomatoes. 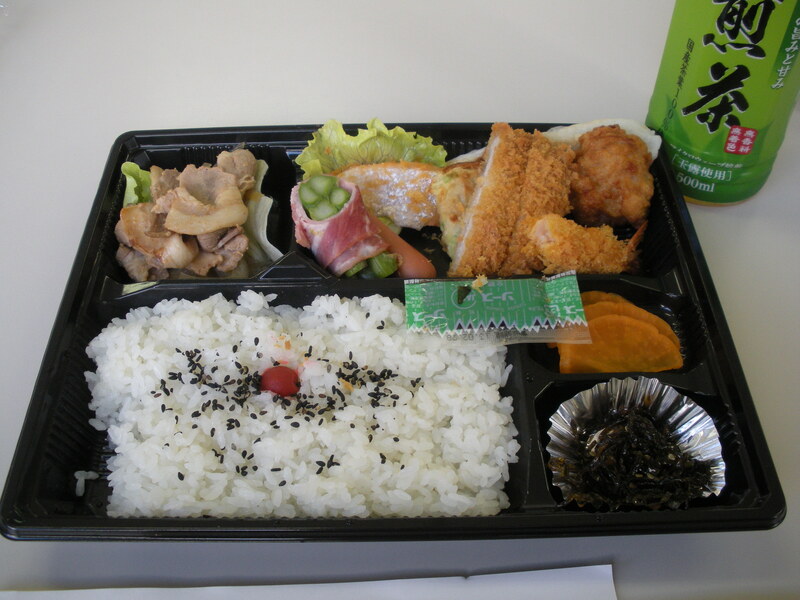 Today we had our English Recitation event, so as a judge I received a bento lunch at the culture centre. So I took a picture for you. My favourite part was the tasty pickles to the right. The students did was quite amazing performances, including a fairly lengthy play based on Japanese legend they wrote themselves in English as well as such famous (and difficult) speeches such as Abraham Lincoln’s Gettysburg address, MLK Jr.’s I Have a Dream, and a piece by Shakespeare. Anyway, they were all really amazing. Broccoli and cauliflower. Cauliflower was the earlier to be cultivated and is closer to the original plant. Broccoli is a variant variety of it. Hayashi rice is a dish that resembles curry rice (especially the sweet curry rice of school lunch) but uses a thick tomatoish demi-glace sauce rather than curry. If forced to choose between the two, the majority of students prefer curry rice, but hayashi rice has a smaller, but solid following as well. I myself prefer curry. Hayashi rice seems to be one of those “Western” dishes that were created in Japan during the Meiji age of enlightenment. Where the name actually comes from is from much debate. It may have been named after a person (Hayashi Yuuteki or another Hayashi with different Kanji). Or it may have derived from the term “haya-shi” (quick death, for the poor animals used to make it) or “haya-raisu” (quick rice, to be eaten before boarding a ship). Or it may come from the English term “hashed beef with rice” degenerating into “hasshi raisu” to “haishi raisu” to finally “hayashi raisu”. By the way, sometimes people translate hayashi rice into English as “Japanese beef stew”, but hayashi rice is has a firm tomato taste that never belongs in beef stew, not to mention in Hokkaido it is made with pork over beef, so I think it is a poor translation. Chestnuts originate from Japan and the southern part of the Korean peninsula. Chestnuts that grow wild are called shibakuri (brush chestnuts) or yamakuri (mountain chestnuts). Today’s Chinese salad had a cool, healthy taste that was surprisingly good, but I am not sure what makes it Chinese. I have never been to China and know nothing about Chinese food, but at most the chinese-style restaurants I have been to, there have been an abundance of dishes coated with a sort of slimy sauce. (I apologise to Chinese people for making such a mean statement.) Today’s salad didn’t have a sauce like that at all, which was a good thing. Also while I don’t like meat/poultry, for being a chicken, the Lemon Basil Chicken was pretty good. Finally, the name of today’s stew is actually a sort of pun in Japanese. “Kuri” means chestnut and “kurimu” means cream: So the name of the stew was actually “kuriiiiimu stew”. Yum! Yum! So, I grew up on an tropical island and there were no chestnuts there. I had never eaten a chestnut, never even seen a chestnut, until I came to Japan. But that is natural. The weird part is that even as a child I was fairly well acquainted with what a chestnut was. Because there is that Christmas song: “Chestnuts roasting on a open fire, Jack Frost nipping at your nose….” Why do I know that song? It’s about snow and cold weather. My hometown is 20 degrees away from the equator! The answer: globalization. Or colonialism. They are actually pretty similar things. The fact that I can know about chestnuts even having grown up in the tropics is pretty awesome, until I considered what sort of native culture was crushed to make room for this alien information….